A few weeks ago, I was invited to Chicago to check out the Kraft test kitchens. I was SUPER excited because it’s always fun to meet new bloggers and to try products before they actually hit the market. I was introduced to Philly Cooking Crème – an innovative take on cream cheese. It’s not just for bagels anymore!!! 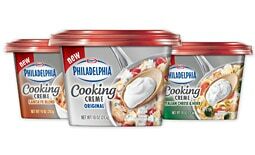 Philly Cooking Creme comes in four flavors – original, Italian herb, savory garlic and Santa Fe. It can be used while sautéing vegetables, making pizza or to spice up spaghetti sauce. The options are endless!!! While in Chicago I had the opportunity to make 2 dishes with the group. We made a pizza and substituted out the tomato sauce for the Philly Cooking Creme in savory garlic. Basically you make the pizza as you normally would but the taste offers a completely different experience. What a great way to change things up during a party! 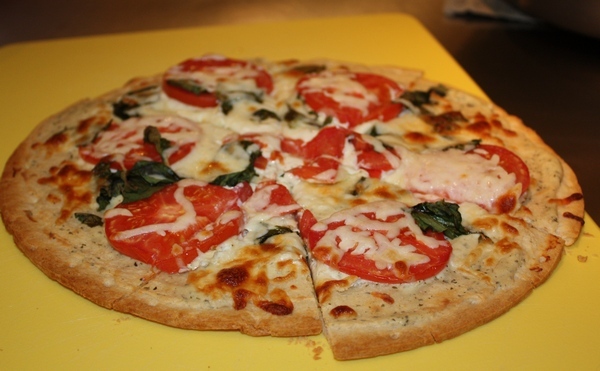 Make the pizza as an appetizer and allow your guests to try something new. The pasta was a SUPER easy dish. For the sauce all we had to do was sauté some veggies in the Philly Cooking Creme. If you love cream dishes, you will REALLY love this option because it gives you that taste you want without all the extra FAT. I wish I took a pic of the pasta – not sure why I didn’t. Perhaps I was too busy stuffing my face. LOL! Are you ready for this new product? It releases in a few months. Will you give Philly Cooking Creme a shot? Love their products….will def look for this at the grocer. yes,i will try the new philly creme item as soon as i see it on the market. sounds like a great idea .when the grandkids (10 of them) are at our kentucky home in the summer we do an assembly line to make individual pizzas and this new item will be a great addition especially for the granddaughter that doesn’t like tomatoe sauce.thanks kraft!